Ranchi, March 19: An FIR was registered against Union minister Jayant Sinha for allegedly violating the model code of conduct while addressing students at the convocation ceremony of a management institute here, police said Tuesday. Sinha is the Union Minister of State for Civil Aviation and a BJP MP from Hazaribagh constituency in Jharkhand. "As per the direction by the district administration, the FIR was filed against Jayant Sinha yesterday (Monday) under Section 188 (Disobedience to order duly promulgated by public servant) of the IPC and under Section 123 of the People's Representation (PR) Act at the Khelgaon police station in Ranchi," a police officer said. 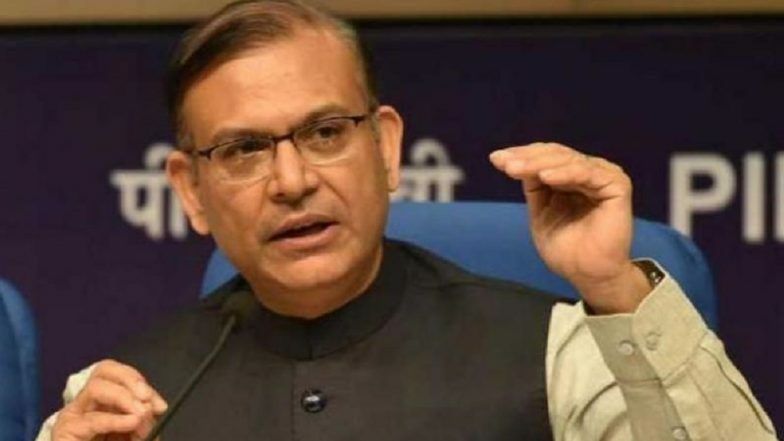 'Air Fares in India Cheaper Than That of Autorickshaws', Claims MoS Civil Aviation Jayant Sinha. All police stations have been asked to monitor violations pertaining to the model code of conduct, he said. The polling will be held for 14 Lok Sabha seats in Jharkhand in four phases from April 29.